"Rearranging my thoughts and fighting burnt out syndrome". . honestly, that was the title of this post before Hyun Joong saved me. I was going to grumble and complain about how tiring and boring blogging life is....I was going to ramble on and on about PSH's case...and rant about a few things, but when I saw KHJ's message in Planet Hyun's blog, suddenly the world just got brighter !! Credit: (English translation) www.twitter.com/howlovelylala and SS501UFO @Planet Hyun. I did retro candy-ppopgi (*which is a kind of darts game and winner will get a huge carp fish shaped candy) on the street with the manager, scuba-diving instructor and film maker bro. me : It's been so long, why don't we try that????????? SCI : okie. Let's try it. me : How to do this??????????????????? candy ajuma : just rotate the plate and throw the darts. when you get the number, you will have the prize on the number. me : wow. What if I dart this carp fish???????? candy ajuma : Try first.. It's possible. I played again and again but couldn't get small bird-shaped-candy or pistol-shaped-candy.........even stick candy. candy ajuma : aigoo~~~~~~~~~~~~~ you can't. I will give you this instead, take this. Candy ajussi was not interested in here and just reading a newspaper.. He might have been laughing up his sleeve. me : Ajuma, can I change the number of choice???????????????? Ajuma : aigoo... I don't think you can. if you change, it will be harder. just keep going on. I've n ever seen people succeed with changing. I am spreading this hard won candy for the Whiteday. Hehehehe....my lil' urchin boy strikes again with his boyish fun. 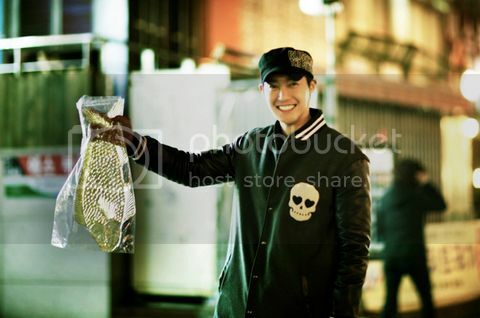 Hyun Joong dear, that Carpfish candy must be a FEMALE Carp-fish candy . . . kekeke it's just playing a bit hard to get. It's a bit enchanted too, coz it's a lovely carp-fish candy who likes the number 52 !! Photo credit : as seen at Planet Hyun blog. Hi Myoce, this boy is really unique. While the other boys had the usual lolly candies, he just had to have the carp fish candy. Look at his satisfied and naughty smile while showing it off. His uniqueness has really captivated me from the start.He's really very down to earth, Gracie...but that is also unique these days. Winning that Carp fish really brought him pleasure, I guess the same pleasure as if it were a real fish he caught from the waters ! I fill his happines and I'm happy with him too. So cute and lovely, HJ is my pronce. hahaha.....that's hyunjoong, our 4d prince!!! his unexpectedness and uniqueness is priceless....which is hard to find in other stars. aja aja our boy, he's the vitamin of my life! thanks for sharing the story, moyce. Yees....I agree he is cute ! You are right his 4D-ness is hard to find in other stars. That's why I love him !